Lately it has been impossible to take outfit pictures without looking like a complete mess from the crazy wind. Thsi year seems so windy compared to before, and I really am not liking it. You can hardly tell I have bangs anymore! So I think when it comes to my personal style my favorite feeling is feeling girly and classic in my clothing. Last year I went through a somewhat edgy phase and it never felt right, but whe nI'm wearing clothes with ruffles, bows and polka dots-the shoe fits perfectly. I feel like I would never have realized the importance of personal style and feeling confident within it if it wasn't for blogging. I love that my blog captures all of my fashion phases, and who knows. Maybe one day I'll look back at this style and think this was just a phase. So dainty and feminine! I love it. Super pretty and girly outfit! Cute! That blouse is darling! Your hair is so cute, too! Haha, I went through an edgy/ goth phase myself and now I dress quite femininely...I suppose it never felt quite right to me either. :P I do still like adding a bit of "edge" to my outfits, though! 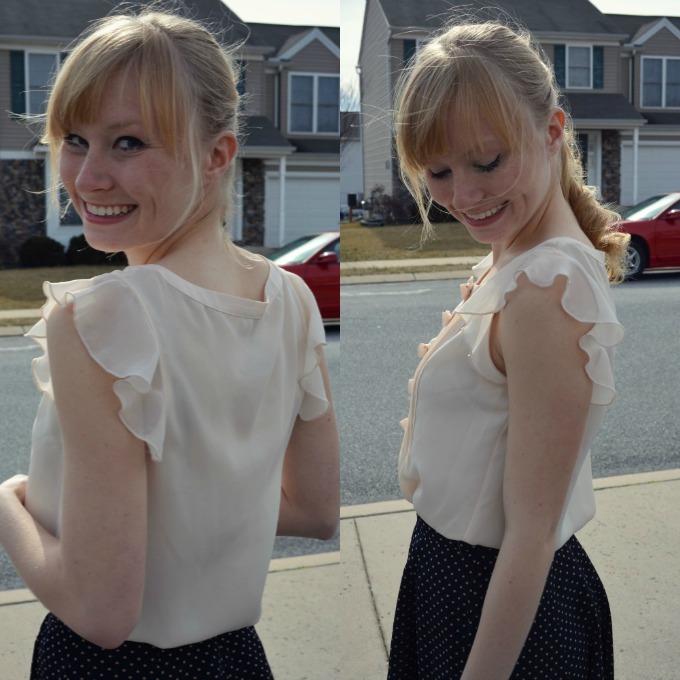 I love that top, perfect for spring! It's always important to feel comfortable in what you are wearing. I'm glad you found your niche! I love your skirt and blouse! You look so adorable! I love that skirt a whole lot and your shoes are fabulous! I think that describes my style too! Love this top with the little bow details!! I absolutely love that top!